The Authentic Foods GF Classical Blend is a simple all purpose gluten free, corn free baking flour created by Annalise Roberts, author of Gluten-Free Baking Classics. This all purpose flour is great for making gluten free cakes, muffins, cookies and pie crusts. 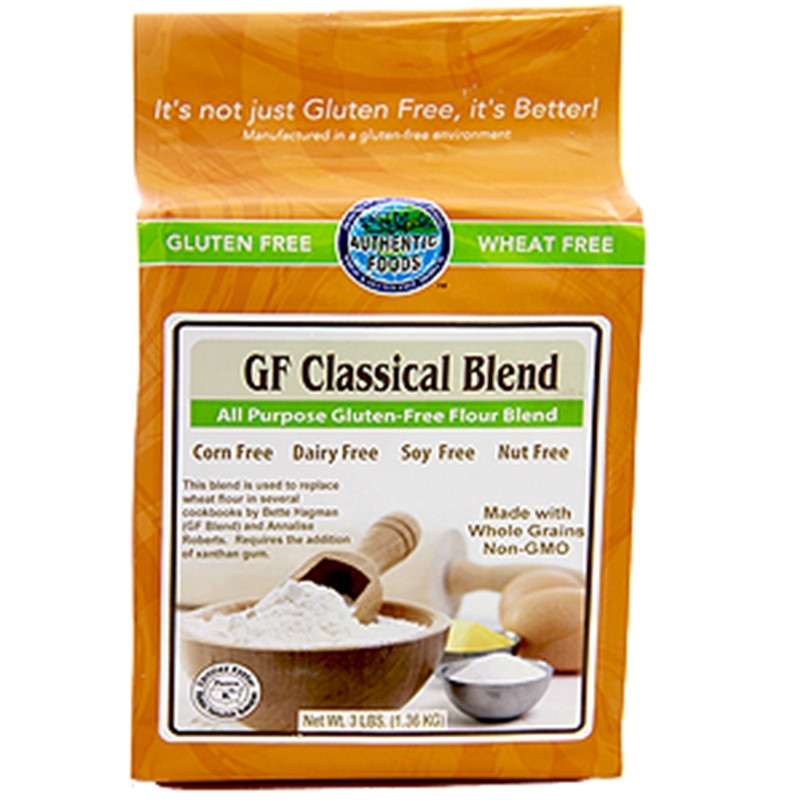 Although, the GF Classical Blend is not recommended for making breads. "It is very important that you use an extra finely ground brown rice flour, (and not just any grind) or your baked goods will be gritty, heavy and/or crumbly. Currently, Authentic Foods® in California sells the only one we can find other than those sold in Asian grocery stores. Authentic Foods® rice flour is powdery, just like all-purpose wheat flour. It can be bought online and in natural food stores; the address, e-mail, and phone appear below. Take note: Authentic Foods® now makes the above brown rice flour mix already made up under the name GF Classic Blend." "...for those who don't feel like taking the time or effort to mix their own flour mixes, Authentic Foods has simplified our lives by coming up with a line of fantastic mixes of their own. My personal favorite is the GF Classical Blend." This recipe is taken from the book, Gluten Free Baking Classics. They are easy to make with very little preparation. Preheat oven to 350 degrees Fahrenheit. Position rack in center of oven. Place cupcake baking liners in a 12-cupcake baking pan. Beat sugar and eggs in large bowl of electric mixer at medium speed for 1 minute. Add flour, salt, baking powder, Authentic Foods Xanthan Gum, oil, milk and Authentic Foods Vanilla Powder; beat at medium speed for 1 minute. Pour batter into prepared cupcake cups. Place cupcake pan in center of oven and bake for about 20 minutes or until center springs back when touched and cupcakes are lightly browned. Cool on rack for 5 minutes. Remove cupcakes from pan onto rack and cool completely before icing.